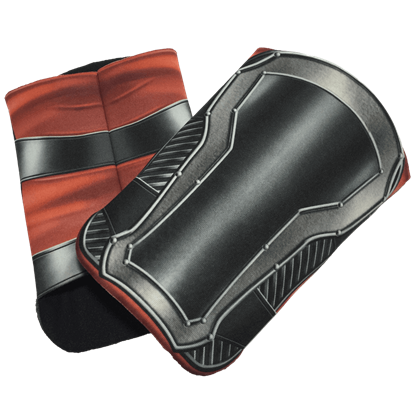 The son of Odin and heir to the Asgardian throne, Thor is a superhero named after the mythic Norse god of thunder. 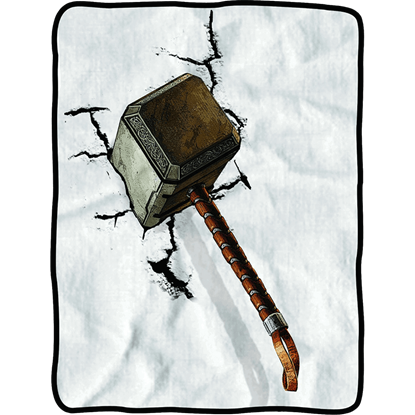 Wielding his mighty hammer Mjolnir, Thor is a founding member of the Avengers and appears in many films within the Marvel Cinematic Universe, including his own titular film, its sequel The Dark World, Age of Ultron, and more. First debuting in 1962, he has since become a popular character in animated television series and video games. Fans of this heroic thunder deity will find a variety of Thor collectibles and apparel at Superheroes Direct, including costumes, t-shirts, accessories, and more. Blankets and other decor featuring Thor and his fellow Avengers add a heroic look to any home. Our statues, bobble heads, diorama sets, and POP figures all make perfect collectibles for any fan of this Norse god turned hero, while our Thor keychains, pins, drinkware, and other accessories are all great ways to casually show off your love for this noble Asgardian. 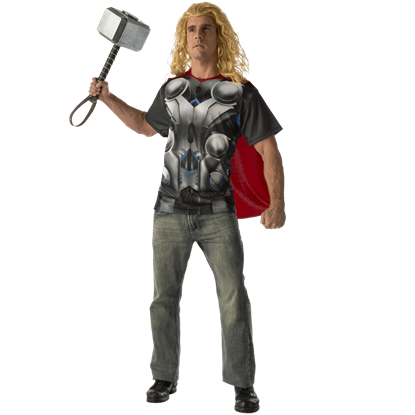 Evoke the classic might of Thor when you wear the Adult Deluxe Thor Costume Top with Cape. 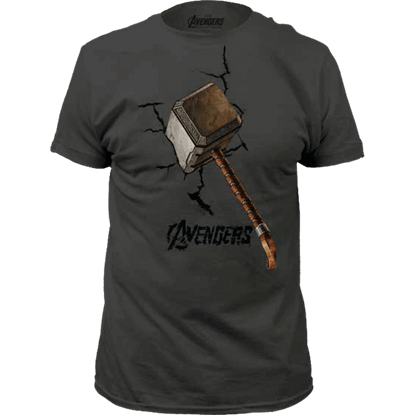 This fantastically padded t-shirt style top recreates the look of superb Asgardian muscles, embellished with printed armour and belt details. 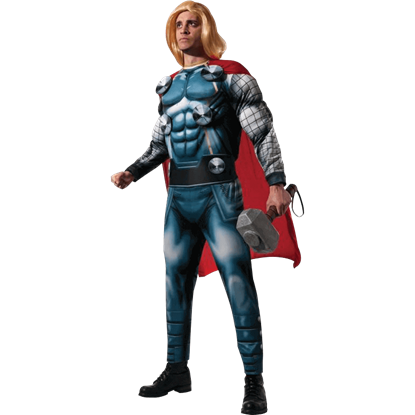 You have the chance to look like the crown prince of Asgard in this fantastic costume based on the comic book Norse god of Thunder. 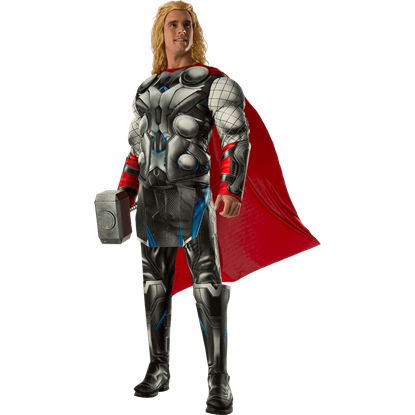 The Adult Marvel Deluxe Thor Costume makes a great choice for dressing up on Halloween or for parties. 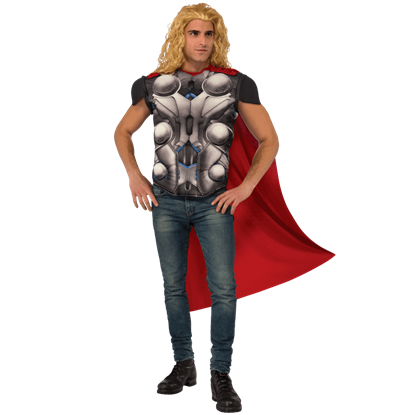 When you want to want to add superhero style to your daily wear but your hair is too fabulous for a helmet, consider this Adult Thor Costume Top and Cape. 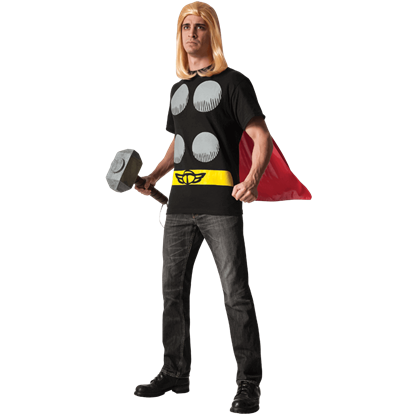 This licensed costume is perfect for Halloween or a superhero movie premiere. Thor, son of Odin, joins the Avengers to save Earth from alien attacks and supervillain phenomena. He is the crown prince of Asgard, home of the Norse gods. This Adult Thor Helmet will enhance your classic Marvel comics Thor costume. 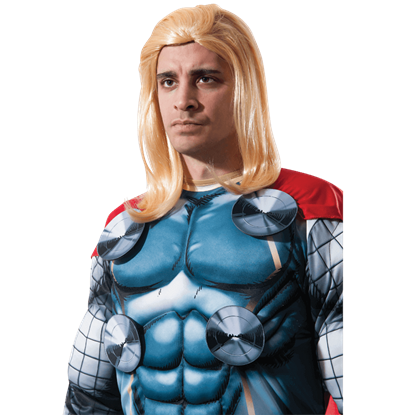 Growing out your own hair to match the length of Thors may take quite a while, so wear the Adult Thor Wig for instant long, blonde locks. 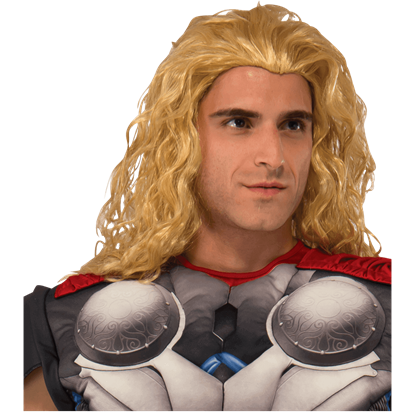 An essential part of this Avengers look, you can now achieve his coveted hairstyle with ease. 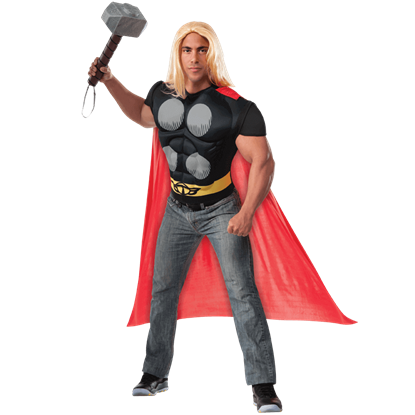 Without his flowing golden locks and enchanted hammer, the Asgardian god of thunder resembles any other Viking. 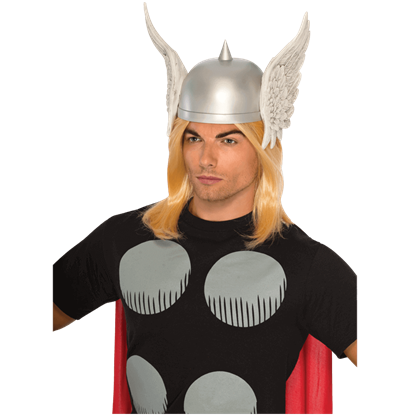 So when you dress as Thor, wear this Adult Thor Wig, which is likely easier than proving yourself worthy to wield Mjolnir.